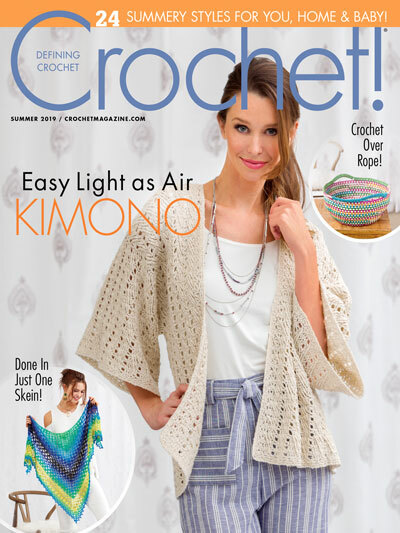 This post contains affiliate links for LoveCrochet. If you make a purchase by clicking on them, I make a small commission at no extra cost to you. Thanks for your support! I have been having a lot of fun making wreaths for my home – like my Granny’s Patriotic Wreath. After 4th of July passed, I got to thinking a fall wreath would be the perfect one to make next. I have been wanting to redo my sunflower applique, which you saw the new version a couple weeks ago in my Sunflower 2.0, to make it look more like a sunflower, and sunflowers are everywhere for fall, alongside pumpkins. I spent a lot of time thinking on how I wanted to arrange them. First, I thought about covering the whole wreath, then I contemplated adding a monogram, but this simple design won me over, and I am soooo happy with it! This post is a collection of patterns, and a little of the how-to to make your own wreath. If you purchase the PDF, you will receive all three patterns in one. If you would like a PDF version of this post, you may get one through either my EyeLoveKnots Etsy Shop or EyeLoveKnots Craftsy Shop for a small fee. This fee is to compensate for the views lost when you no longer need to return to the blog to for the information, as you will have your own copy. Plus! It helps fund supplies for new projects to share with you! Shop EyeLoveKnots Etsy: Sunflower Wreath. 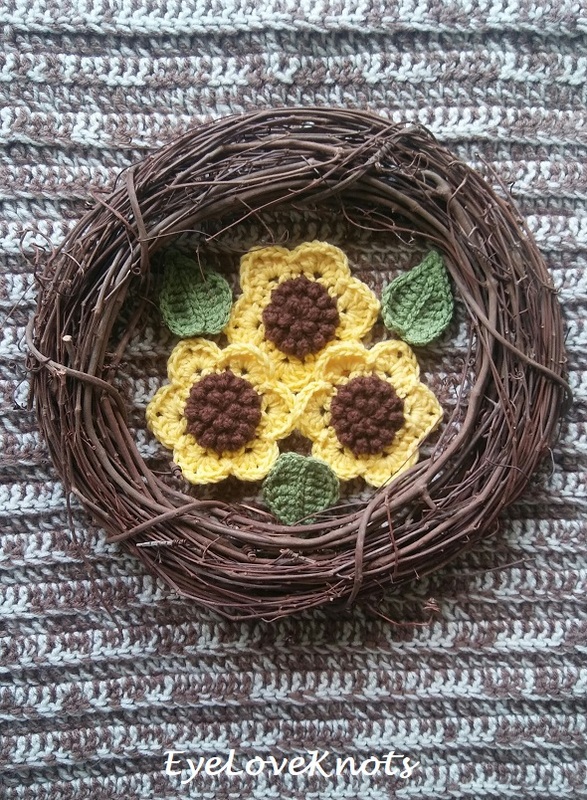 Shop EyeLoveKnots Craftsy: Sunflower Wreath. 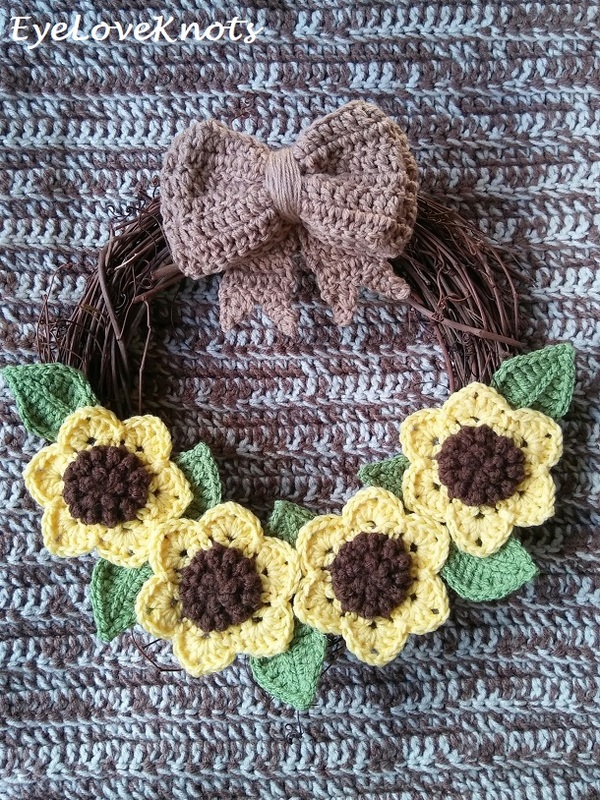 Shop EyeLoveKnots LoveCrochet: Sunflower Wreath. Are you a Raveler? 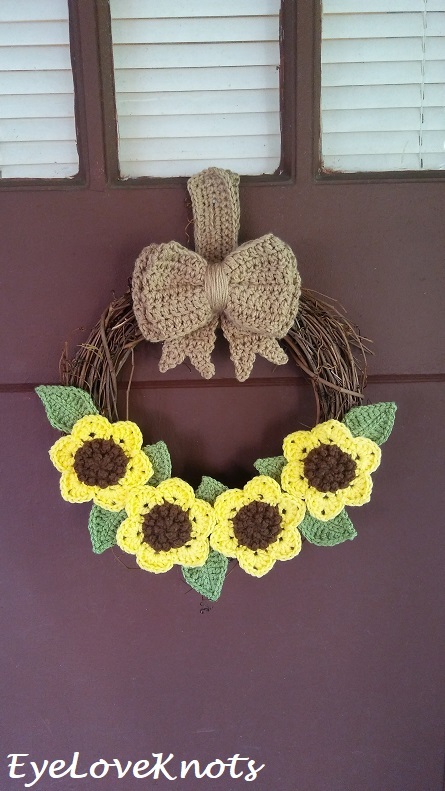 Share your version of this project on Ravelry – Sunflower Wreath. I used up yarn from my stash to complete this wreath, but you can use all of the same brand yarn/weight if you have it. I worked my wreath up in a couple days, splitting up the pieces, for a total of just over 3 hours. 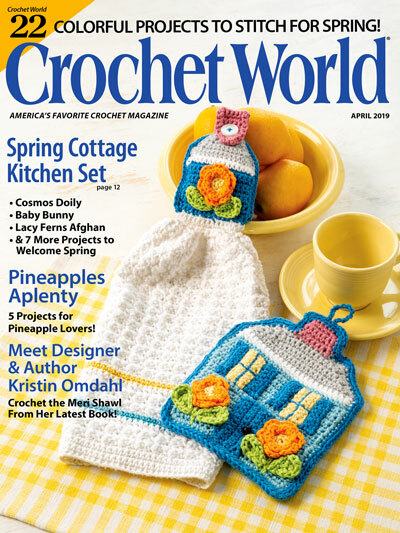 Make 4 Sunflowers using my Sunflower Applique 2.0, Free Crochet Pattern. Set aside. Make 8 Leaves with vein using my Basic Leaf Pattern 2 Ways, Free Crochet Pattern. Set aside. Make 1 Bow using my Double Layered Bow, Free Crochet Pattern. Set aside. R4: Chain 1, turn. SC into the 1st SC, and each SC across. Weave in ends, and set aside. This wreath hanger is used to hang on a wreath hanger. The open ends will be at the top, and the slit is where the loop of the wreath hanger will be placed through. Decide where to place your flowers, and leaves. To do so, lay them down on your wreath, and carefully move around until you have found the perfect spots. I say carefully because you don’t want your crocheted pieces to get stuck on any twigs from the wreath. I laid my flowers down along the bottom of the wreath imagining a line separating the center with two sunflowers on each side. Next I added my leaves in between the sunflowers, making sure they didn’t touch each other, but were sticking out enough to be seen over the sunflowers. After this was just the way I wanted it, I went ahead and hot glued them in place. I also hot glued the bow to the wreath hanger in a way that while the wreath was hanging, you would see it just above the wreath. You can easily leave the bow off if you don’t want it, or if you don’t use the crocheted hanger, you can just hot glue the bow directly onto the wreath. Please feel free to make and sell your own Sunflower Wreath using this pattern, but please DO NOT claim this pattern as your own nor should you sell my pattern, and DO NOT re-publish my photos as your own. DO NOT copy and paste my pattern anywhere, link to it instead. Join the EyeLoveKnots Crafting Community on Facebook to share your creations, and see what others are up to! I love your wreath!! Sometimes simple does it! It’s a cheerful wreath and very stylish, well done! Thanks so much, Sigrid! I am loving it too. Your wreath is so welcoming and warm looking. The sunflowers have such friendly ‘faces’. Just precious. I have never learned to crochet so even more in awe of your handiwork! Thank you so much, Leslie! I really love seeing them when I come home. Makes me happy. 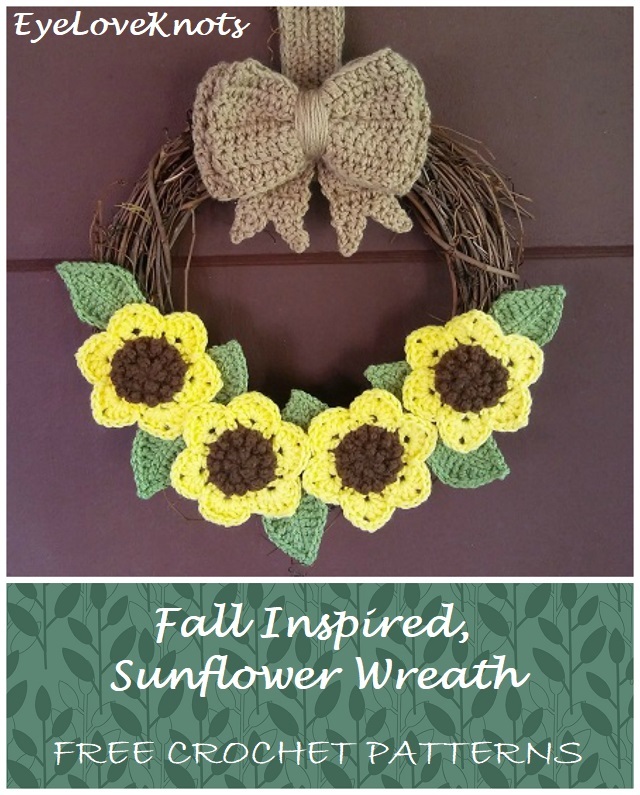 This is such a beautiful wreath, I just love your sunflower pattern! Definitely pinning this to make later! I love the wreath, it’s simple and beautiful. It would work well as summer decor too. Thank you for sharing at The Really Crafty Link Party. Pinned. 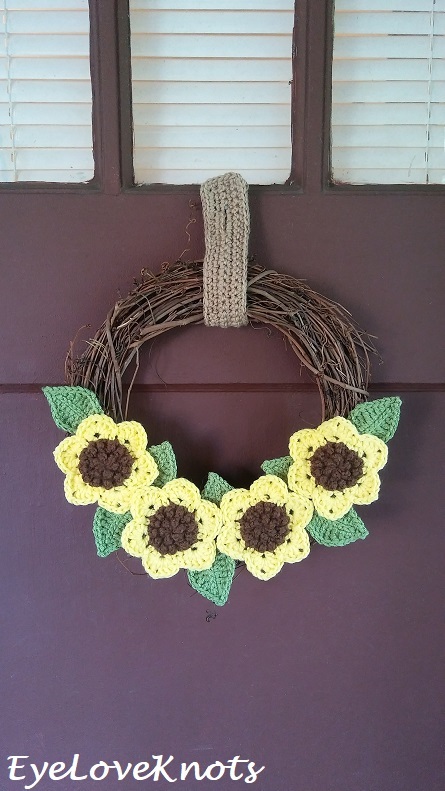 It’s funny because up until last year, I really thought sunflowers were a “summer” thing, but nope… Who says crocheted ones can’t be all year though? I really like this. Thank you so much for sharing. Patience, and practice. I used to have lots of messes too. Working through the links to my party. Now I can see how it has all come together. I would love this on my front door! Pinned! This wreath is so pretty and is perfect for fall. Right now I have been working on a shrug for myself. So cute! Perfect for fall! 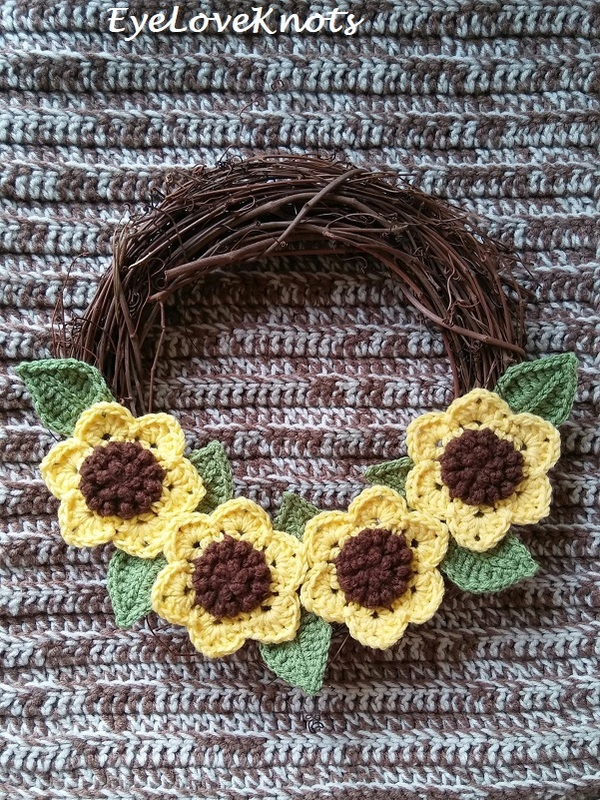 I loved your granny square Christmas wreath and now I’m loving this sun flower theme. Thanks, Lillian! The Christmas one needs one more little tiny thing, and then it’ll be ready for gifting (I am going to send it to someone I Christmas exchange with). Will make sure to share it before I send it off though. Hi! 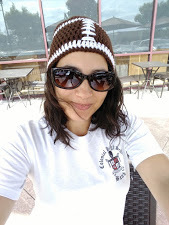 Just letting you know that your post is being featured tonight at Best of the Weekend Link Party (8 p.m. EST). Thank you for sharing with us! Thank you for the support, and for letting me know! I love the sunflowers and so does my daughter. I can’t wait to make us each one of these in the new year!